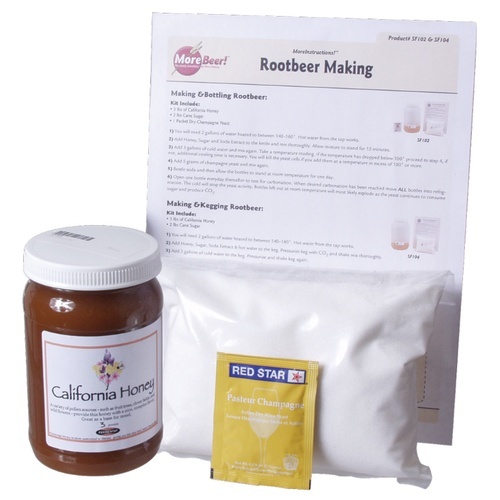 This kit is designed to work with one of the Root Beer extracts, SF40-SF80, to make 5 gallons of rootbeer. Kit includes 3 lbs of honey, 2 lbs of sugar, champagne yeast and directions. For an even more unique flavor try adding one tablespoon of vanilla extract per five gallons. This kit does not come with Root Beer extract, which must be purchased seperately. My wife & some of her friends won't drink beer & sometimes a little wine. Usually, though, when they play dominoes, cards or mahjong they want to drink soda pop. This Root Beer is a crowd pleaser. While this is just the honey & sugar component, I have been playing with the extracts to get the best possible. The jury is still out on that one. This kit is a great base product to start the manufacture process! Used to be they included everything you needed. Now you have to buy the root beer extract separate. Come on, just build the kit and price it together. That said, its a quality kit, easy to brew, and guests tend to like it better than my beers. Go figure. Good experience for my son, now he has his own "brew". Great Root Beer, but protect yourself from the possibility of exploding bottles. The directions are easy to follow and the kit produced great tasting outstanding quality root beer. I would rate it 5 stars if it weren't for the problems we encountered with bottles exploding. Stopping the carbonation process by killing the yeast with refrigeration is key to preventing bottles from exploding. You need either a large dedicated refrigerator or to put the bottles in ice chests. At first we tried using our kitchen refrigerator and had a few bottles explode making a huge mess; not fun.